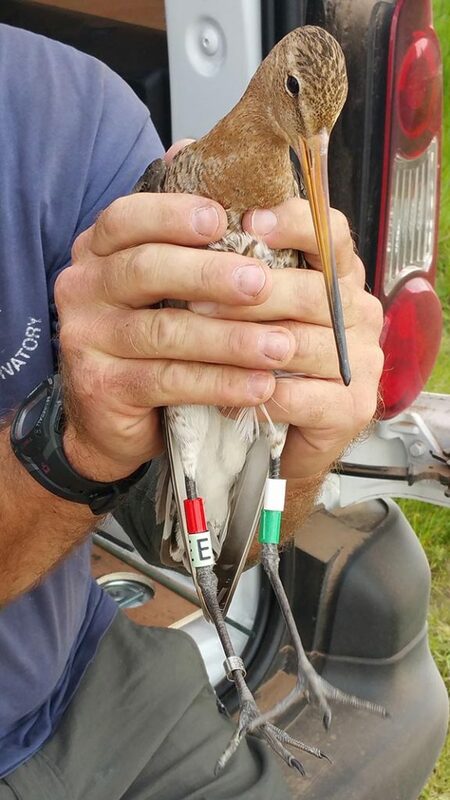 We have been colour ringing black-tailed godwits at the Nene and Ouse Washes to help us understand more about the birds' movements in the breeding and non-breeding season. Godwits are known to undertake long and often complex migratory journeys, and the marking of individual birds provides valuable information about the remarkable journeys these birds undertake. Submit your sightings of birds marked under our scheme to us and help us find out more about these birds. Your sightings really do help us build a picture of where these birds go and the information provided informs our conservation efforts. If you leave us a contact email address we will send you information about the bird that you have seen. Birds ringed under our scheme wear a lime colour ring stamped with the letter E. Sightings of other colour ringed godwits should be sent to limosalimosa@waderstudygroup.org. When and where was your sighting? If you saw the colour rings, which combination of colours were they? Sightings are important but the bird’s welfare must come first. Please take care not to approach or disturb the godwits in order to read colour rings. Black-tailed godwits are afforded special protection by the Wildlife and Countryside Act, meaning that it is an offence to disturb the birds during the breeding season without a formal licence. Alternatively, you can report your sightings to us via email by contacting us at theteam@projectgodwit.org.uk. All godwits colour ringed under our project have a lime colour ring on the right hand leg with the black letter E stamped on ring. Further guidance on recording wader colour rings can be found on the International Wader Study Group website. You can also find out details of other schemes that are ringing birds and their organiser's contact details.